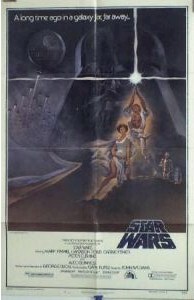 Original Star Wars style A one sheet from this 1977 classic. Folded with the well known proof of authenticity mark, the "union stamp" at bottom. And, NO "Hair line" on Luke's belt, which indicates a "pirated copy, NOT original. (for ALL of our Star Wars one sheets). 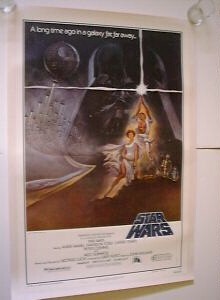 Original Star Wars style A one sheet from this 1977 classic. Has been beautifully professionally linen backed for spectacular presentation.